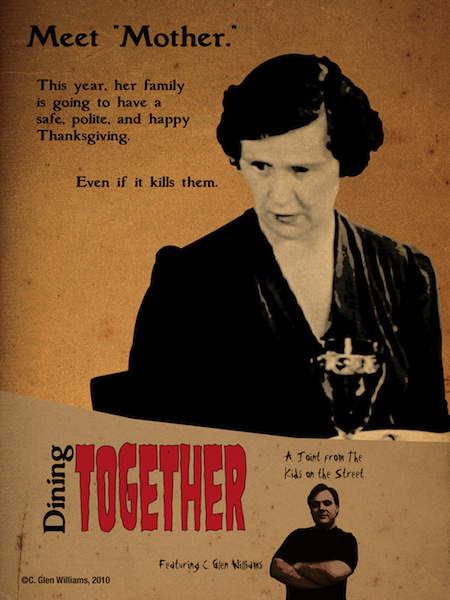 Thanksgiving is a time of togetherness. A time to come together with your family and share in food and fellowship. Mother spends hours working on a delicious meal while Father flirts with the next-door neighbor. And then there are the kids, who are absolutely no help whatsoever. And to top it off, there's the omniscient narrator who recommends -- nay, demands -- that all the diners be at their happiest. And how can they be happy? Why, by being polite, of course! So take small bites, clean up after yourself, and when your mother brings an unidentifiable black lump to the table, smile and choke it down. C. Glen Williams of The Kids on the Street is here to help you survive the ordeal of "Dining Together!